It's Foodie Freebie Friday once again!... And this one is a bit special because it's also my birthday! For this week's Foodie Freebie Friday, I asked readers what their messiest experience was in the kitchen either cooking or baking and what they made. It was pretty much all over the board as to what various things that cluttered up our kitchens. Chocolate, pasta sauce, making homemade pastas, flour, sugar, cake batter, frosting, melted butter... pretty much all those sticky, gooey ingredients we love to work with have caused some of us more cleanup than we really bargained for. Let's not forget those wonderful appliances that make things easier in the kitchen (and can be messy to use!). You know the ones - food processor, stand mixer, hand mixer, anything that whizzes and whirls about! My messiest experience in the kitchen was homemade pasta. I was making pasta dough and my husband helped me with rolling it in my pasta machine. I had flour and dough everywhere in the kitchen. It was quite a mess and needless to say, that was the last time I made pasta from scratch (not including gnocchi). Well I hope this week's Foodie Freebie will help you with your next messy kitchen adventure and to keep you looking stylish too! Who's going to win this week?! 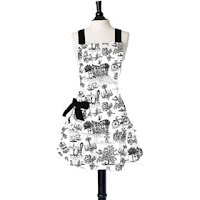 Whoever wins will have their choice of one of these Jesse Steele aprons! 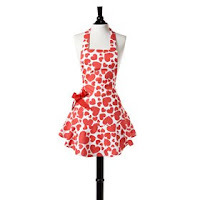 The following aprons are called "Sweethearts" (red), "Leopard" (brown), "Pink Poppy Fields" (pink), and "Cafe Toile" (white/black). Read on to see who won! Congratulations Mary Ellen! 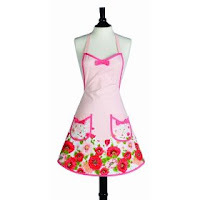 Please email me at [email protected] so I can send you your new apron! Thanks again to all those that commented and stay tuned to the next Foodie Freebie announcement on Monday, May 4, 2009! Don't feel discouraged if you haven't won yet - I have a whole year's worth of freebies ahead and next week is one that you won't want to miss! 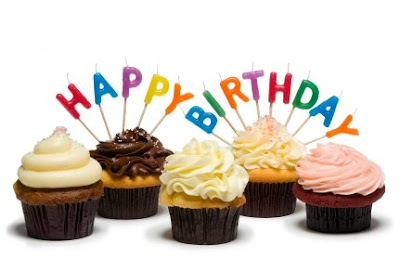 Happy Birthday Joelen - I hope you have an amazing celebration!! Happy Birthday Joelen, here's to an amazing day!! Hey hey Happy Birthday! Have a great day filled with lots of food! 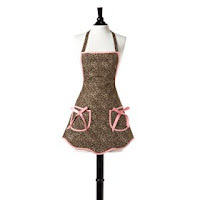 Gotta love those stylish aprons! So cute. I usually just bring leftovers, and throw in a yogurt and veggies.